I very rarely share on my blog crafts I do that are inspired by others. Once in awhile I will but it's not very often. I try to keep my shared creations authentic to myself. Blogland and Pinterest are over-flowing with ideas so why duplicate, at least that's my theory. However, over the past week I've done two crafts that I've found off of other people's blogs that I absolutely adore. I did some slight tweaking on both to make them my own but boy, they are super clever and worth spreading the word about. Cute! Right?! I think so. I was asked to come up with something that we could pass out to the men at my church on Father's day. 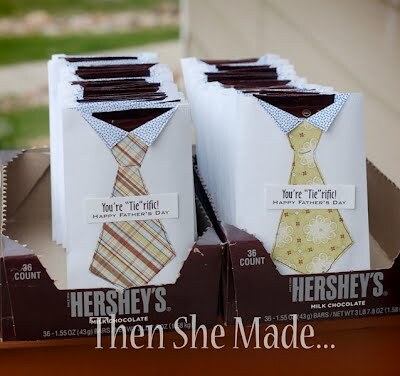 I was just going to do a candy bar with a paper tie on it BUT then I saw their creations and knew it was perfect. I love how it looks like a shirt and tie. 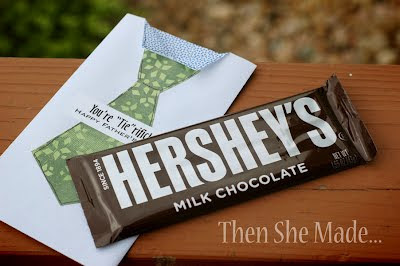 I did tweak the idea slightly, instead of putting a note inside with the candy bar like they did, I just came up with the ever so cheesy saying, "Your TIE-rific", and glued it to the outside. It was all so quick and easy. I made 56 of them today. So, thanks so much to the creative ladies - who are all sisters - over at Bits Of Everything. I so appreciate you sharing your great idea with us - and I think the men at my church will too. If you feel like it, pop on over to their site and say hi! Tell them I sent ya. Tomorrow I'll share the other brilliant idea that I've been making lots of lately. Wow! Thanks for the shout out! 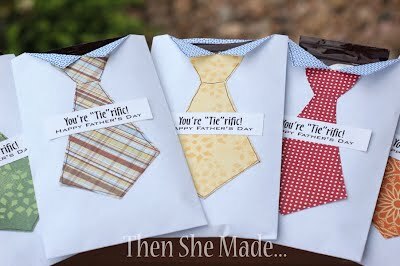 I LOVE how your cards turned out and your "tie-riffic" was perfect! Great job. ~Emily @ Bits Of Everything. Did you use scrapbook paper for the ties or are they printed on a color printer? I love your idea and blog in general! yep, just scrapbook paper. Mostly scraps. I love this idea! 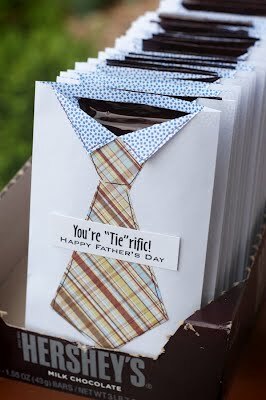 These are the cutest Father's Day Cards I've seen. And what Dad wouldn't love a little treat! I hope it's ok that I share it over on my blog: LittleLDSIdeas. did you sew your tie down? Or just trace a line that looks like it? No, I didn't sew it. Just used a pen and made little marks to give it an outline. Did you use a envelope too? I made these for the men in my church too. So stinkin' cute! Thank you so much for sharing your talents and ideas! I'd love to know what fonts you used for your wording - they look great! Muito bonita a embalagem! Obrigada por compartilhar. I don't know if you still check this thread, but do you have the file for the little tags with the sayings? We are going to make them for the men in our ward this weekend and it would save time if I didn't have to make it. :-) Anyway, thanks for the cute idea!! Where did you find the envelopes with the Polka dots on the inside?